Franz Anton Hoffmeister was born in 1754 in Rothenburg am Neckar, Austria and died in Vienna in 1812. He went to Vienna in 1768 to study law, but his great interest in music prevailed and he devoted most of his life to music publishing and composition. He had a successful music publishing firm and, in addition to making his own compositions available, he published works by Haydn, Mozart, Beethoven, Pleyel, Albrechtsberger, Vanhal and Paul Wranitzky. Hoffmeister and Mozart were good friends. As a composer, he was most prolific and composed symphonies, concertos for flute, keyboard, violin, French horn, viola and contrabass. His chamber music output encompassed duets, quartets (many for flute and strings), quintets (some for flute, violin, 2 violas and cello and string quintets with 2 violas) and others. 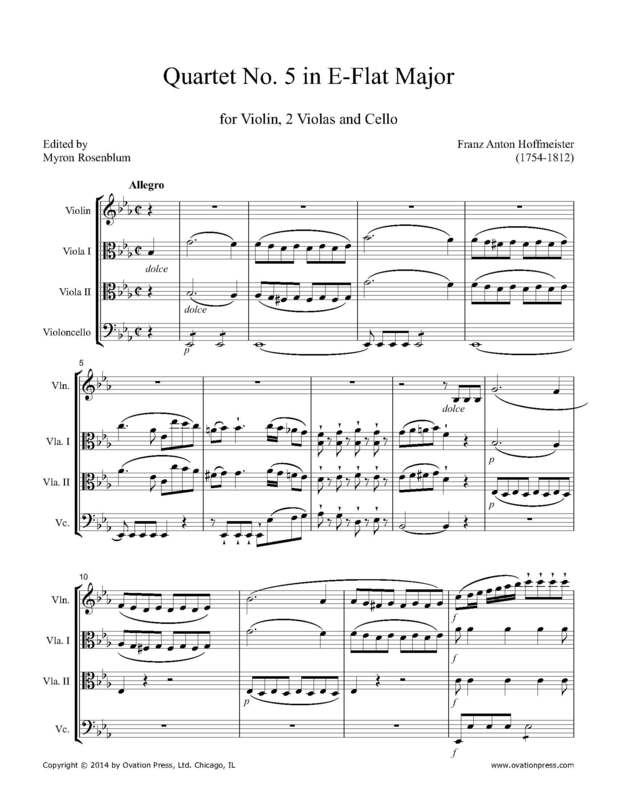 Hoffmeister’s liking for the viola is apparent by his viola concerto, (a staple of the violists’ repertory), duets for violin and viola, many viola quintets, fine Etudes for viola and the “6 Quatuors Concertants pour Violon, deux Violes et Violoncelles,” Opus 20. Five of the quartets are in three movements and one in just two movements, the Menuetto movement lacking in all of them.They are quite skillfully composed, charming and offers the violas much to do. Hoffmeister frequently has the two violas and cello play alone and makes much of the darker timbres of the three instruments. This quartet, No. 5 in the set is in three movements: Allegro – Adagio – Allegretto. The editor has left the composer’s slurs and wedge markings intact. The performers will surely phrase according to their own musical judgments. The frequent “wedge” markings may not always indicate shortness of the notes, but on occasion might refer to a leaning on emphasis of the note. Hoffmeister’s music, though not always as inspired as his great contemporaries Haydn and Mozart, is nevertheless well constructed with often charming themes, a good rhythmic sense and occasional fresh harmonies. His music is well worth performing. The repertory of quartet music for violin, two violas and cello is small but of interest and intriguing. In addition to the fine six quartets of Hoffmeister, there are 7 excellent such quartets by Carl Stamitz, 6 quartets by Giuseppe Cambini, and Johann Albrechtsberger. Felice Giardini wrote “Six Quatuor Concertans” where the 5th and 6th quartets are for violin, 2 violas and cello.